In September 2017, I took a trip to one of America's most beloved and beautiful national parks. As a Kiwi I am no stranger to spectacular scenery, but this pristine stretch of the Rockies was unlike anything I’ve ever seen. Arriving in East Glacier with some good friends from Missoula, we enjoyed two unforgettable days in a land of moose and bear. With the largest population of grizzlies in the contiguous 48, Glacier is a realm in which us humans are not the apex predators. Denied our usual command of nature, one must be as alert as deer in this house of bears. My amazing Missoulian friends: Jen, Garin and Amy. There were many moments on the snowy hike up to Grinnell Glacier that I cherish, not least bumping into a solitary grizzly mere feet from the trail. It was one of the tensest moments of my life, but thankfully the bear kept its distance before lumbering across the trail into the woods. I felt supercharged for days after the encounter. Perhaps occasionally crossing out “don’t get eaten” from your to-do list is good for you. I highly recommend it, but only if the task can be completed. ​We got within metres of a curious mountain goat, only to watch it disappear over a cliff like a superhero once it was tired of us. I ran to the edge and saw the goat bounding along the sheer rock face with ease. The next day, driving Going-to-the-Sun Road, we spotted a mama grizzly with her cub not far up the hill. She raised her snout and sniffed the air in our direction, before breaking into a run and disappearing over the rise. It was another reminder that in western Montana, nature reigns supreme. Two of my favourite shots from the Glacier trip. So much was memorable about my week in Montana, with moments like these only the tip of the iceberg. When I returned to Australia after this 2017 trip to the US, I resumed work on The North American Continent. It was lined up so the first place I’d draw upon returning home was none other than the Crown of the Continent: Glacier National Park. There’s a fair bit drawn around Glacier. Chief Mountain, St Mary Lake, Wild Goose Island, Bird Woman Falls, a grizzly in Bob Marshall wilderness, an ascendant mountain goat, a marmot (aka “whistle pig”), the Prince of Wales Hotel just over in Waterton. ​In particular I wished to include a crown, referencing the widely used “crown of the continent” phrase that describes this near-pristine ecosystem. Question was, where in the park should the crown sit? Where is the head upon which a crown deserves to be placed? At first I thought Mt Cleveland made sense, being the highest peak in Glacier NP. Still, it seemed a shallow interpretation of the crown. It isn’t even the tallest peak in Montana, and a mere high point does not reflect the sort of mystic deference evoked with the phrase “crown of the continent”. Then, I remembered somewhere that does. A mountain that was pointed out to me while we were there: Triple Divide Peak. Triple Divide is a totally unique phenomenon. On this one peak, water clearly flows to three different oceans: the Pacific, the Atlantic, and the Arctic. This is the only such triple divide in the world, and is thus the hydrological apex of the North American continent. This is where a crown should sit. A single peak where the oceans encircling a continent come together as one. ​I wanted to ensure my map shows this triple divide clearly, so one can trace the water all the way to each ocean. I love the idea of people following rivers with their fingers like one follows a maze. On the west side, waters flow into the Flathead, the Pend-Oreille, the mighty Columbia, and finally the Pacific Ocean. On the east side, waters flow to the Marias, which flows into the Missouri, Mississippi, and finally the Gulf of Mexico. To the north, water flows into St Mary Lake, which feeds the St Mary River, the Saskatchewan watershed, Lake Winnipeg, the Nelson River, and finally the Arctic Ocean via Hudson Bay. All three can be traced from the Triple Divide crown. ​Now, there’s a slight wrinkle here, demonstrated in the next image. Hudson Bay, source of Triple Divide's Arctic destination, can be easily argued as a marginal sea of the Atlantic. Its widest outlet, the Hudson Strait, feeds the Labrador Sea. When using this definition, Triple Divide does not technically feed three oceans. ​I get it, but I feel Hudson Bay might as well be Arctic for the purpose of an epic divide. Along with its northern positioning and frozen waters, the Foxe Basin (the bay’s northern arm) flows into the Arctic Ocean proper via the Fury and Hecla Strait. These, among other reasons, are part of why Hudson Bay is so often classified as an Arctic body of water. And even if you feel strongly that the bay is Atlantic and thus disqualifies Triple Divide - not to worry! North America has you covered. A few hundred miles up the Rockies is Snow Dome, on the BC/Alberta border. The glacier that caps Snow Dome sends water to the Pacific via the Columbia River, the Arctic Ocean proper via the Athabasca and Mackenzie basins, and Hudson Bay via the North Saskatchewan. Upon learning about Snow Dome, I was suddenly very curious. I put conscious effort into ensuring that my drawing of Montana's Triple Divide shows three watersheds clearly meeting at the peak. Yet the area around Snow Dome was drawn months ago, before I knew Earth even had such a divide. If I cast my eyes up to where Snow Dome should sit, will I see the triple divide on my own map? ​I located the peak, referenced it against my map, and to my astonishment the answer was yes. The Columbia Icefield, where Snow Dome is, quite clearly sends water in three different directions. I stood there in my studio fascinated. A mountain that sends water to three oceans is insane. There’s a reason there’s only one occurrence in the world (or to be more exact, there are two but they’re mutually exclusive); the chances of this happening are slim. The only other continent bordering three oceans is Asia, and it’s so vast that the Arctic watersheds get nowhere near those of the Indian Ocean. So I was excited to notice I had drawn a triple divide at Snow Dome, Canada. A fascinating piece of content was unconsciously drawn just by following the rivers. ​To puzzle over whether Hudson Bay is Arctic or Atlantic distracts from the clear fact that Montana’s Triple Divide Peak is the greatest of Earth’s hydrological divides. After all, the naming and delineation of our oceans is hardly a science. And any divide that excludes the Mississippi basin (as Snow Dome does) is hardly the hydrological apex of North America. In Montana, and Montana alone, water that will flow through Arctic tundra meets those that feed the steaming swamps of Louisiana, and those that cut through the Cascades and into the mighty Pacific. Triple Divide Peak is a crowning moment in the geography of not just North America, but the entire planet. Destructive forces lie at the very heart of this world. Drawing Haiti was a reminder of the many challenges associated with depicting trauma. This blog discusses the nature of these challenges, with focus on two forces familiar to Haiti - earthquakes and fire. The island of Hispaniola. Click for detail. ​A few months ago, while preparing a commentary on drawing Haiti, a huge 7.8 earthquake rocked the centre of New Zealand. The most powerful quake to hit my home country in nearly a century, it was a reminder that geography is a story of upheaval and change. Mountains cracked and heaved, pulling hundreds of kilometres of coastline straight out of the ocean - along with vast stretches of submarine rock. This new shoreline, birthed in seconds, left immense reserves of shellfish to rot in the sun while landslides smashed a hole in our main national highway. All the lower North and upper South Islands were shaken, including both my hometowns, leaving rattled nerves and condemned buildings. Fortunately, the timing and location led to only two casualties, but the destructive power was breathtaking. I live in Australia now, a continent of seismic calm, but talking to friends and family while watching pictures and analysis come in – it left me considering something wider than the overview I was writing about Haiti. This world would be unrecognisable without destruction and trauma. ​So, what of trauma in cartography? Submarine rock was lifted permanently out of the ocean in a matter of seconds. Scenes like this were common along the Kaikoura coast, after New Zealand's 7.8 earthquake in November 2016. An example of the earthquake uplift from the air. Having just drawn earthquake-shattered Haiti around the time of the quake, I’d been considering this question a lot. Devoting a blog to it seemed appropriate, with particular focus on two traumatic forces that play a role in Haiti: fire and earthquakes. Today I will present several examples in my work where I’ve grappled with this problem, and offer thoughts on the traumatic nature of geography and how we might discuss it. So first, why does this present a challenge at all? Trauma is not evenly spread around the world. Some countries suffer earthquakes, others don’t. Some burn, some flood, some freeze. These earthly forces are interwoven with the story of civilization, which too has a profound imbalance of pain: prosperity uplifts some, while poverty restrains others. This can present unique challenges for cartographers, not least those making pictorial maps. When we choose to display trauma while elsewhere beauty flourishes, might this harden existing notions of despair? The Greater Antilles next to my hand/pencil for scale. Focusing on the beauty of the world is compelling, not merely because we want maps and art to be beautiful, but because cartography is critical in how the world is viewed. Acknowledging trauma can deepen shadows that already depress places and people that deserve the dignity of beauty. But life is not utopia. Rather than decorate the world, I’d like to engage with it. First and foremost a cartographer relies on data, and data has a way of encouraging complexity. In creating pictorial maps, the temptation to focus solely on idealistic content is strong. However, beauty is not a matter of good or bad. Truth has a beauty that tells a more interesting and relatable story than any utopia. Even in regions with far more wealth than Haiti I have irritated locals (who are justified in feeling this way) - by drawing smog-belching factories, open-pit mines and grim oil refineries. In parts of Mexico ravaged by cartels I’ve drawn assault rifles and opium poppies. Prince William Sound in Alaska has the sinking Exxon Valdez spilling oil through its waters. In Bhopal, India, I left the cityscape entirely without colour to emphasise the toxic legacy of the Union Carbide disaster. These are reminders of real pain, and I don’t blame residents of such areas if they dislike my depiction. No one wants their home defined by trauma. After all, we connect with our land through much more than a lens of despair and disaster. Yet we’re also unlikely to view it as a sunny brochure of attractions and regional iconography. Some places are impossible to imagine without the changes brought on from recent trauma. Port-au-Prince, Haiti is one of those places. ChristChurch cathedral before and after 2011's devastating quake. ​To draw this shattered city, I settled on a method I used back in my South Asia/Australasia map. Christchurch, New Zealand, was devastated by a violent 6.3 in February 2011. 185 people died as many buildings in the city collapsed, huge boulders barrelled down the hills, and liquefaction turned concrete to slush. The most iconic landmark and symbol of the city, the ChristChurch Cathedral, was toppled. As is the case with symbols, its destruction was symbolic too - the crumbled church came to symbolise an earthquake that changed a city forever. I drew it lightly with a faint aura to make it somewhat ghostly, but ensured it was as prominent as if the building were still standing. A crane rising from the broken skyline symbolises the rebuild, while the deference paid to the cathedral is to respect both trauma and the spirit. The collapse of Haiti's Presidential Palace came to symbolise the 2010 earthquake. ​Hard copy maps will always be time stamps. Borders change, forests burn, new landmarks are built while old ones crumble. Port-au-Prince, like Christchurch, required addressing an earthquake that stripped it of landmarks and thus much of its identity. As the imbalance of trauma in the human story is pervasive in Haiti, their quake was much more deadly. On January 12, 2010, a shallow 7.0 struck Port-au-Prince. Centred only 25km west of the city, it turned dense hillside slums into landslides of rubble and bodies, as up to 70% of the buildings in the city collapsed. The final death toll will never be known, but estimates run as high as 200,000. Among the deadliest quakes in recorded history, it will take much more than seven years for its terrible legacy to abate. It was the confluence of many other traumas that made the earthquake so especially deadly. The poorest country in all the Americas, it has suffered a long history of political instability and unrest. This turmoil at the top has played no small role in another example of physical trauma - and one equally unavoidable in cartographic depiction. In less than a century, the large majority of its forests have been burned and felled, wreaking havoc. Rivers are either dry or flooding, topsoil has made way for bedrock, and the northwest is now home to the largest desert in the Caribbean. Less than 2% of its original forests remain, with only a small pocket to be found at Pic Macaya in the far west. The Dominican Republic, Haiti’s wealthier, healthier neighbour to the east, has had a very different history with deforestation. The border they share is one of the most disparate in the world. Matching exactly what one can see from space, I’ve ensured the colours on each side make this clear. 60% of Haiti's energy comes from coal. This is central to the loss of forest, so I have drawn burning coal in the northwest at the site of this largest Caribbean desert. Fire in art evokes motion, and wherever phenomena are of a fiery nature their inclusion can be highly effective in a map. From erupting volcanoes to gas flares on oil refineries, fire always makes for visceral content. Even satellite pictures of the Earth at night tell us profound things about human geography via a network of blazing lights. Click for detail - look out for forest fires on Sumatra, Borneo and West Papua. ​In a previous map, South Asia & Australasia, I drew two examples of burning forest. Throughout Indonesia, sections of tropical rainforest are up in walls of flames. Suffering the most rapid loss of tropical rainforest in the world, islands like Borneo and Sumatra endure a contemporary trauma central to its geography. This is catastrophic not just for Indonesia. Its haze-cloaked neighbours suffer, while the wider world, with its eroding biodiversity, cannot afford such losses. A postcard-perfect pictorial map of these regions is tempting, as orang-utans and rhinoceros thriving in the jungle make for superb content. But perhaps we’ll care more for these precious fauna when the precariousness of their situation is highlighted. ​The other example on this map was also burning forest, but with a completely different context - bushfires in Australia. While flames are for the first time searing the inner reaches of Borneo’s rainforests, fire has long been essential to the lifecycle of the Australian bush. Indeed, many species of Eucalypts require burning to reproduce. The event is no less traumatic for those at its mercy, as Melbourne’s 2009 Black Saturday fires sadly remind us, but it is in harmony with the Australian biome. So, even within the same phenomena, the opacity of trauma and the diversity of geography present very different tales. As the eucalypt tells us, fire is rebirth. As the tropical hardwood tells us, fire is destruction. Avoiding trauma in geography is to avoid the very forces that shape our world. Acknowledging this is critical in my view; even if it may remind some of very real hardship and danger. 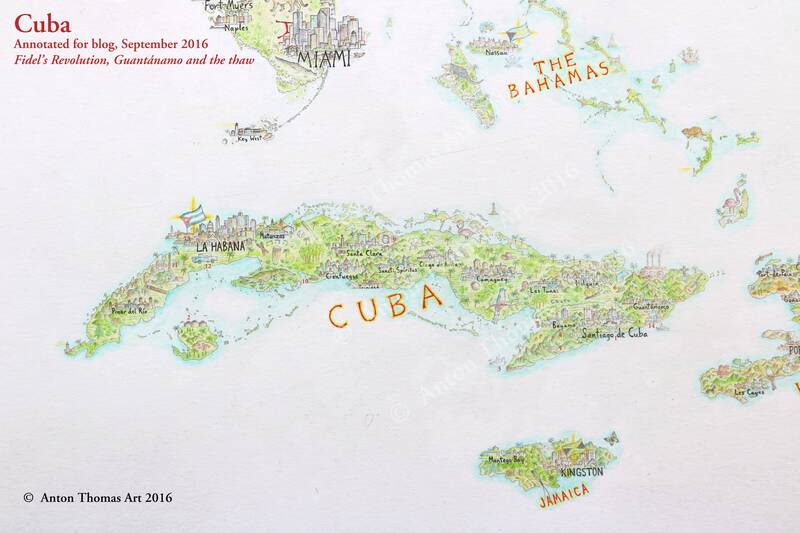 Cuba without annotation. Click for detail. To finally embark on the blogging process, I figured I’d write on the recently completed island of Cuba. Drawing this country was an extremely captivating project, and I couldn’t think of anywhere I’d more like to blog about. However after knocking out a first draft, I found myself editing well over 3000 words. As much as I'd like to unpack Cuba all at once, I suspect such a lengthy blog is not a good choice for my first ever post. So, it will be in two parts. Today we will tour the map to discuss the basic history and legacy of the Cuban Revolution, featured heavily in this portrait. As no discussion of Fidel’s Cuba is complete without the fiery relations with the United States, we'll also cover Guantánamo Bay and the future in light of the fledgling American-Cuban thaw. As I discuss the various sites drawn, each point of focus will be emboldened and annotated with a red number. This number will correspond with the annotations on the main map below. Click on it to open a full version in a new tab. I hope this is a useful tool to share what I’ve discovered, but it is by all means in its testing phase. All suggestions are most welcome to refine this method. I wish to tell a story that paints a picture of the regions I draw; seems an appropriate way to discuss an actual picture. Map with annotations. Click for detail. Cuba has a rich and storied history, from the original Taíno inhabitants, through the landing of Columbus, to spectacularly wealthy sugar barons and the Spanish-American War. In the Cuba of 2016 however, no period still resonates more than the overthrow of US-backed dictator Fulgencio Batista by Fidel Castro in 1959. Indeed, critical revolutionary moments are in all corners of this depiction of Cuba. The Revolution began in earnest on July 26, 1953, with Castro’s failed raid on army barracks in Santiago de Cuba . Fidel and his brother Raoul were captured and imprisoned at the Presidio Modelo  prison on the Isla de Pinos (now the Isla de la Juventud). They were held here for several years until Batista caved to political pressure and in 1955, remarkably, he released the Castro’s. It did not take long for them to flee the country. They spent the next year touring the US and Mexico gaining support for their movement. Upon raising enough enthusiasm and capital, the Castro’s – now joined by Ernesto “Che” Guevara and Camilo Cienfuegos – covertly returned to Cuba on a leaking overcrowded yacht dubbed the Granma . The yacht plays a big role in this region, and indeed when Cuba’s administrative divisions were re-drawn in 1976, a new province was carved out of the Oriente and christened Granma. I have drawn the yacht approaching the very beach in Granma they landed on 60 years ago. Just as before, it was a disaster for the revolutionaries. Completely overwhelmed by the Cuban air force, those who escaped alive managed to flee, wounded, into the most rugged mountains on the island: the formidable Sierra Maestra. Under the shadow of Cuba’s highest mountain – Pico Turquino (1974m) , Fidel set up his secret revolutionary headquarters. The unassuming hut I have drawn in these mountains is the Comandancia de la Plata , the base of operations for the ultimately successful overthrow of Batista. The Comandancia is now an attraction for the more intrepid travellers that make it to the Sierra Maestra. This part of Cuba is especially important in regards to both the revolution and Fidel himself. Indeed, just southeast of Holguín you’ll see Castro’s iconic cap . This is at Birán, his hometown. Things improved a lot for the movement as their mountain base proved an outstanding site from which to foment revolution. Following a series of losses, Batista was finally overthrown in the Battle of Santa Clara in December 1958, when Che Guevara derailed an armoured train packed with soldiers and munitions on its way to Santiago to crush the revolution. In the city most associated with Che, you can find his mausoleum , along with Tren Blindado , a monument to this most consequential derailment. A mural of Che in the world-famous Guerillero Heroico  pose adorns a hill in Santa Clara, watching over a city heavy with his presence. Only 3mm wide and long, it was an exceptionally difficult thing to draw. I nearly gave up at first, but the prospect of this iconic image was just too much to pass on. It is remarkable the extent to which Guerillero Heroico has permeated popular culture around the world. The commercialisation of the image seems so completely at odds with the hard-line Marxism of Guevara. The brief period between Fidel’s rise to power and the total souring of relations with the US is fascinating. Before diplomatic relations were severed in January 1961, Castro toured the US as Prime Minister of Cuba and charmed the country. The photos of a young Fidel with Malcolm X in Harlem, and shaking hands with Vice President Richard Nixon, are from this period. The mass nationalisation of American assets enraged the US, leading to the failed Bay of Pigs  invasion - represented here by a tank. This very tank is an antique from the actual invasion, still on display today at Playa Girón. When 1500 CIA-backed Cuban exiles tried to invade the country in April 1961, it was a disaster for newly-minted President Kennedy. An Eisenhower project he reluctantly signed off on, it was crushed in three days by Castro. 118 of the CIA-backed militia were killed, the rest captured, publicly interrogated, and thrown into the Presidio Modelo . The failed invasion greatly strengthened Castro’s nascent regime and pushed him to develop closer ties with the Soviet Union. With my hand for scale. A year and a half later, the world balanced on a knife-edge during the Cuban Missile Crisis. Anticipating more American attempts to overthrow his government, Fidel welcomed the stationing of Soviet nuclear missiles on Cuba – a counter for the US missiles stationed in Turkey at the time. A Soviet SS-4 nuclear missile  stands to attention in Pinar del Río province in the west, the location of many of the missile sites that initiated the crisis. In those harrowing days, the world came closer to nuclear war than it ever has, and this beautiful Caribbean island was the theatre in which it played out. Since the sobering crisis of 1962, there have been countless attempts to undermine and even neutralise Castro. The most impactful move against Cuba has been the US embargo, now in its 56th year. As evidenced by the iconic old American cars, or "yank tanks” , that still dominate diesel-choked Cuban roads today, the embargo has ensured only that the Cuban economy remains substantially stunted. As a method to weaken the Communist Party’s grip on power, it has clearly failed. Fidel stepped down in 2008 due to his health, and his younger brother Raoul continues as president to this day. The Communist Party, whose headquarters  can be seen flying the Cuban flag in Havana, is still very much in control. Finally, the last place I drew on the island - a brief return to the United States. The infamous Guantánamo Bay . I thought long and hard about how to draw Gitmo. The necessary policy I have across this map is to maintain political neutrality as much as I can. Without a doubt, the mere choice between addition and omission is enough to forgo this vision, but there’s far too wild a range of data to attempt a deft navigation of political terrain. So, rather than focusing on the detention centre with an orange jumpsuit or something to that effect, I tried to simply address the oddity of the long American presence on the shores of a foe. Indeed, behind the Cactus Curtain, Gitmo has the only McDonalds on the island. What better way to highlight the absurdity of this arrangement than a symbol so emblematic of the unchecked capitalism that Castro’s Cuba rejects. On the eastern side of the bay, a simple American flag flies above a wall. And, finally, a US battleship. Despite Gitmo’s well-known detention centre, its primary function is and has always been as a naval base. Cuba is certainly going to change in the coming years. Fidel Castro turned 90 the same day I drew the tank at Bay of Pigs. His younger brother, President Raoul Castro, is 85. In 2014 the Obama Administration set in motion a perhaps irreversible thaw in relations, despite GOP bluster in an election year. While any thaw or normalisation is surely a step in the right direction, it’s worth speculating on the potential impact of the colossus to the north. Will the McDonalds at Gitmo no longer be the only one in Cuba, merely the first? Will, as I recall Anthony Bourdain once suggest, Havana’s Malecón one day have a Four Seasons and a Best Western? Cuba’s people have paid a high price for the political circumstances they are in, but the country has been free to develop its identity isolated from the gravity of the world's most powerful nation next door. Whatever the future holds for Cuba, I hope it strikes a balance between political and cultural sovereignty and the benefits of economic development. There are many more things to discuss about this portrait of Cuba – from the music to the geography, fauna, to more history; in particular the legacy of Christopher Columbus’s landing here in 1492. I will post the other half of my discussion on this island in the next week, but first – please let me know what you thought. What worked? What could be better? What would you like to know more about? Was the numbering process effective? Many thanks for reading. Stay tuned for Part Two on Cuba: Son Cubano, Columbus and the painted snail.